The special effects, the music, and the actors and crew create such a spectacular world for us to get lost in, while almost forgetting we are watching a movie about a superhero. I always find that the hardest reviews to write are for movies that I thought were out of this world, and Marvel Studio's Doctor Strange is at the top of my writer's block list. From the script to the special effects to the cast, Doctor Strange is one of the best Marvel movies to date. After all, some of the best things in life are also the most dangerous. "You really shouldn't have stolen the spells, because the warnings come at the end of the book". Being a huge Marvel fan but never having read the comics, I always appreciate when the movies lay out the background information so that one can follow the entire plotline and the characters. Writers Jon Spaihts, Scott Derrickson, C. Robert Cargill, and Steve Ditko wrote a storyline that one can easily follow. The story is detailed but the characters themselves seem to fill in the blanks so that there is no confusion as to what the plot is and the reasons for why the characters are taking the steps they take during the movie. Any conflict in the dialogue or during the plot within the film is readily explained without any confusion when the film ends. No questions remain at the conclusion of the film- at least with the Doctor Strange movie, itself. Director Scott Derrickson (The Day The Earth Stood Still) has such perception in melding the actors and with the storyline. All the actors seem to play off each other and deliver their lines flawlessly. The apparent relationships that exist, and those that are developing, are executed effortlessly. The direction that Derrickson provides meshes the movie into a complete success. Benedict Cumberbatch (Sherlock) is breathtaking. He plays Dr. Stephen Strange, an arrogant neurosurgeon that seems to need no one and won't take a case that may hinder his reputation. After having a horrific car accident, Dr. Strange is the one who now needs a miracle. After spending all of his money trying to find a way to repair his hands, he realizes that his miracle will not be a medical miracle. He treks off to Kathmandu to find a spiritual healer, The Ancient One, at Kamar-Taj, and all of a sudden, his photographic memory and brilliance take Doctor Strange to an elevation he never thought existed, let alone, one he would be a key player and a savior. When asked about relics that hold magical power to harness within one's self, Strange is told that the relic will choose him. The interaction between Strange and Cloak of Levitation is hilarious. Cumberbatch is Doctor Strange - his off-beat humor, his intelligence, his egotistical behavior- all seen before, as his character Sherlock, is more developed as Doctor Strange and fits the role perfectly. While it's understandable that the role of Doctor Strange should be played with an American accent, and Cumberbatch carries it off flawlessly, the one distraction in the entire movie is that for those of us Sherlock fans, we miss the English accent that is so entwined with Cumberbatch's sarcastic and quit witted personality. Tilda Swinton (A Bigger Splash) plays the Ancient One, a Celtic wise woman who has lived a very long time and protects the Earth from dark forces. When she agrees to take on Stephen Strange as an apprentice, she knows what potential he has to save the world from a force she cannot. Swinton brings depth, humor, and a stability to a role that could have been played in so many different ways. Her acting is refreshing and her sarcasm is well matched against Cumberbatch's. Chitwewl Ejiofor's (The Martian) character, Baron Mordo, finds Strange wandering around Nepal seeking a higher miracle and brings him to The Ancient One. Ejiofor plays Strange's mentor during most of the film, and there are times when Mordo's faith in Strange fails him. What one must remember is that there is always a time when the student surpasses the teacher, and Doctor Strange is no different. In charge of keeping all the ancient texts and spells secure, is supporting actor, Benedict Wong (The Martian) who plays the librarian, Wong. He seems suspicious of Strange, at first, but soon is won over by Strange's intelligence and antics. When Wong's character finally laughs, it is a battle well won by Strange. Wong and Cumberbatch's interactions are serious, like a father trying to keep a child in line. When Wong finally succumbs to Cumberbatch's charms, it is a clear breakthrough and funny to watch. The Blu-ray is the Cinematic Universe Edition, complete with the 3D version, Blu-ray, Digital HD, and DVD. Both the 3D and Blu-ray version are presented in 1080p High Definition, with the 3D having an aspect ratio of 2.39:/1.90. I love watching the special effects jump out of the screen and into my lap. I also love watching a film that I feel like I can reach in and touch everything in the dimension. The 3D version contains both of those elements consistently throughout the film. I felt as immersive in the experience of watching Doctor Strange at home as I did in the movie theater. Audio quality is English 7.1 DTS-HDMA and 2.0 Descriptive Audio. The music was captivating and moved the scenes along. The dialogue was clear and the sarcasm in the characters was easily discernable. Sound quality and music melded together to bring a wonderful listening experience to this film. 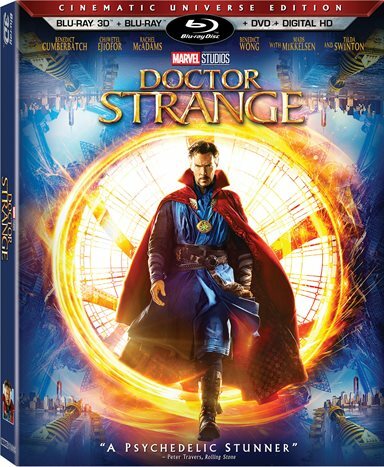 Play movie with Intro on the Blu-ray provides a brief introduction into the world of Doctor Strange by the Director himself. I always find the insights of the crew and cast to provide valuable insight to the movie itself. Audio commentary version is also a wonderful way to watch the film. Fraught with commentary and opinions straight from Director Scott Derrickson, viewers are treated to the how, why, when, who, where, and what. Five Featurettes, which includes A Strange Transformation; Strange Company; The Fabric of Reality; Across Time and Space; and The Sorcerer Supreme are brilliant ways to involve the viewers in the making of the film. The director, the producers, and the cast come together to provide insight into the mystical world of the Marvel Universe, very specifically to Doctor Strange. Marvel Studios Phase 3 Exclusive Look: Start out at Comic-Con 2006 with the Avengers and learn what is the culmination of the Marvel movies. Street level, cosmic level, and now the mystical level of Marvel Cinematic Universe exist and you will find an introduction to all right here. Team Thor Part 2: Chris Hemsworth (Thor) makes an appearance at the end of Doctor Strange, so it's no surprise to find that and interview with Thor has been included. Deleted and Extended Scenes: Scenes that make complete sense except that the movie would have been too long including very scene. -Gag Reel: Fun to watch the cast in their humor. As Director Derrickson stated, "The universe is a profound mysterious place" and Doctor Strange is no less profound nor less mysterious. The special effects, the music, and the actors and crew create such a spectacular world for us to get lost in, while almost forgetting we are watching a movie about a superhero. Download Doctor Strange from the iTunes Store in Digial HD. For more information about Doctor Strange visit the FlickDirect Movie Database.